A transfusion is giving healthy blood or blood products from a donor. In this case it is red blood cells that are given to a fetus. Rh incompatibility—the mother develops antibodies to fetal blood cells. They cause destruction of blood cells in the fetus. Parvovirus B19 infection—a viral infection in the mother. Prevent or treat fetal hydrops before delivery—Hydrops is caused by severe anemia. It leads to fluid collecting in the skin, lungs, belly, or around the heart. It can develop into heart failure. Continue the pregnancy so the fetus can be born close to due date. Tests that were already done will be reviewed. Your belly and womb may need to be viewed. This can be done with ultrasound. If the fetus has hydrops, the blood transfusion will be done right away. Medicine will be used to numb a small area of your belly. A needle will be inserted into your belly. 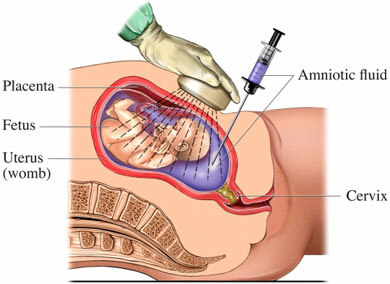 The needle will be passed through your uterus and into the umbilical cord. (With IPT, it will pass in the fetal belly instead of cord.) The donor blood will be passed to the fetus. A final blood sample will be taken. It will show the change to the fetus's blood. The doctor will use this to know if the transfusion was enough and when the next one should be. The transfusions may need to be repeated every 2 to 4 weeks until it is safe to deliver. It can take 1 to 2 hours for the entire process. You will feel pain and cramping where the doctor inserts the needle. The uterus may feel sore. This is more likely if you are close to delivering. This procedure is done in a hospital setting. You will be able to go home after the transfusion. American College of Obstetricians and Gynecologists. ACOG practice bulletin No. 75: Management of isoimmunization in pregnancy. Obstet Gynecol. No. 75. 2006 Aug;108(2):457-464. Rhesus disease. National Health Services website. Available at: https://www.nhs.uk/conditions/rhesus-disease/treatment/. Updated November 6, 2018. Accessed February 12, 2019. Rh factor. American Pregnancy Association website. Available at: http://www.americanpregnancy.org/pregnancycomplications/rhfactor.html. Updated March 2, 2017. Accessed February 12, 2019.
van Kamp I, Klumper F, et al. Complications of intrauterine intravascular transfusion of fetal anemia due to maternal red-cell alloimmunization. Am J Obstet Gynecol. 2005;192:171-177.